Mood board: Karl Lagerfeld took Fendi in a futuristic milkmaid direction for spring, stitching up his voluminous, balloon-shaped clothes with intricate smocking details. The finely stitched gathers are already a difficult accomplishment in cotton, but it took an expert hand – i.e., Fendi’s in-house ateliers – to replica the same technique on butter soft leathers and silk jerseys. Best in show: Though there were some excellent 3D plastic flower appliqués and other more complex detailing, some of our favourite looks were the simpler ones. Lagerfeld created beautifully cut lines in a balloon-sleeved crisp cotton shirt that was tucked into a perfect high waisted black wool skirt with panel slits cut to mid calf. It was utterly chic. Finishing touches: At the end of the day, Fendi sells handbags, so it was no surprise to see every look loaded with a new and original accessory. 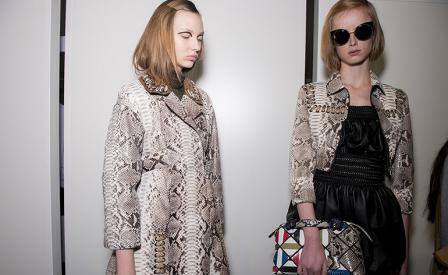 From mini peek-a-boos with striped woven bodies to python handbags intarsia’d into a striped effect and then covered with furry appliqués, each bag was an artistic collage of creativity.